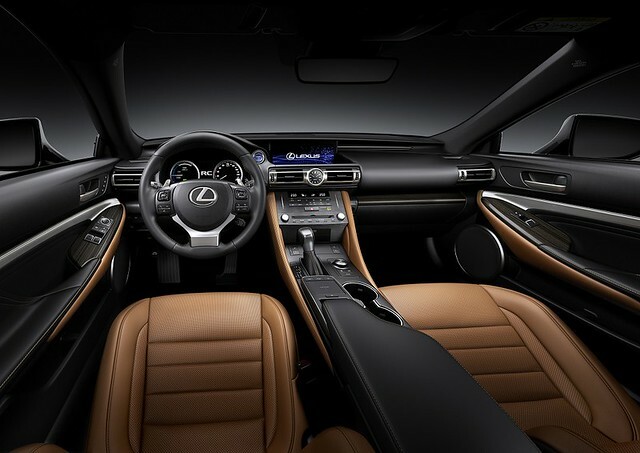 The Paris Motor Show earlier in October saw the debut of many cars – one of these was the new Lexus RC coupe. With new styling features, wheel designs and equipment specifications for the hybrid model. Not only that, there are three grade concepts available to choose from; the RC, F Sport and Takumi models. Looking at the RC first, this model includes newly-designed 18-inch alloy wheels, the Lexus Safety System, parking sensors at the front and rear, smart entry and Tahara upholstery interiors. There is also the option of sunroof and leather upholstery in black or dark rose colour tones. For additional comfort, drivers can also opt for an integrated steering wheel heater for those drives when the mercury plummets. On-the-road pricing starts from £38,800. Next up, the F Sport features the characteristic F Sport styling inside and out for that nippier look. The spindle grille with the trademark F Sport mesh pattern, 19-inch multi-spoke alloy wheels sports look steering wheel, foot pedals and front seats. Speed and performance are the key drivers here so even the mechanisms to slow the car down are ‘sped up’ by orange brake callipers that are visible through the slim wheel spokes. There’s also the sporty paint finishes to choose from – exclusive to the F Sport; Solar Flare, Naples Yellow and Azure Blue. On-the-road pricing starts from £42,300. Finally, there is the pinnacle of the grade range – the Takumi, where it is all about premium details. With a Mark Levinson sound system, 19-inch 10-spoke alloy wheels, a sunroof, leather upholstery interiors and even a memory setting for the driver’s seat to epitomise the luxury aspects. On-the-road pricing starts from £45,800. Lexus, known for its work in design that spans beyond car design, has recently collaborated with trainer maker Norman Walsh to inspire a new sports trainer concept. Check out our little brother site – DiscerningGent.com – to read about the latest.